at just 2km away. Suggested to all those in love with luxury.CharmingPuglia.com suggests you to rent a car to reach your desired Hotel. The Masseria San Domenico lies about 700 meters from the sea on the coast between Bari and Brindisi in the territory of Savelletri di Fasano. It is one of the oldest watch towers built in the XV century. This fortified building was used to warn against attacks by the Turks. The estimated travel time arriving from the airports Bari and Brindisi, is approximately one hour drive. CharmingPuglia.com suggests you to rent a car to reach your desired hotel. After a careful restoration, completed respecting the old shapes and the original building materials, the tower was converted into a deluxe resort whose charm recalls the history of the region, a land where the Eastern and the Mediterranean cultures have mixed well together. Against the backdrop of the blue sky and sea, the whitewashed stone buildings stand out amidst ancient silver olive groves, among which lies a magnificent irregularly-shaped pool encircled by rocks and plants. You can enjoy here a relaxing and peaceful place with an efficient and careful service. The Masseria San Domenico accepts in August bookings with a minimum stay of 7 nights. Children over 12 years are welcome and no pets are allowed. All rooms and suites are equipped with air conditioning, satellite television, safe, wireless internet connection free of charge, mini bar, hairdryer and radio. 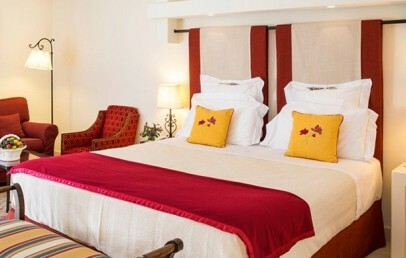 The beds are king size (190x200cm) but, on request, the hotel can provide 2 separate beds. At only 700mt from the Masseria, guests can find a sandy beach with beach service from June to September. Another beach, also with facilities open from June to September, is available for all guests at the San Domenico a Mare, a dependence “pieds dans l’eau”, approximately 1 km distance. This is a rocky beach and the entrance to the sea is easily accessible. Both beaches can be reached comfortably with a free shuttle service that runs every hour from the hotel. The Masseria San Domenico was one of the first hotels in Italy to offer thalassotherapy treatments. The refined and purified sea water of the Adriatic Sea, taken at 400 meters depth, is rich in minerals and trace elements that are essential for the improvement of the biological functions of the human body. The indoor heated sea water pool (37°) is the heart of the thalasso center. Further it offers 8 Thalassotherapy rooms, 14 massage rooms with a choice of traditional and oriental massages, gym, sauna and Turkish bath as well as aromatic colour showers and Kneipp treatments. For those who want to combine their vacations with a wellness program "remise en forme", can combine Thalassotherapy treatments with assistance of a nutritionist, supported by a Mediterranean, tailored diet and specific treatments tailored to individual needs. Please Note: To access the indoor Thalasso pool it is required a daily Thalasso package with minimum three treatments (Euro 165,00). No exceptions will be granted. People under the age of 16 years are not allowed in the Wellness Centre neither at the Fitness. A few meters away from the Masseria is a 18-holes golf course which belongs to the Masseria San Domenico and welcomes experts as well as beginners. The hotel also has tennis courts. The "San Domenico" restaurant welcomes its guests for lunch and dinner in a suggestive dining room with arched vaults dating back to the 1700's. Keeping with its original purpose of oil press, the Masseria San Domenico's restaurant offers specialties from the typical cuisine of Puglia and a rich selection of the best wines from this region. Vegetables and home grown products, olive oil and a great part of the fruits are grown or produced in the land which belongs to the Masseria. Fresh fish and shellfish come from the Adriatic Coast. The restaurant "Pool Grill", adjacent to the pool, offers a regional meal buffet lunch. In the restaurant room "Il Fico" guests can have their breakfast (07.30-10.30) whereas the two bars "San Domenico" and "L'Ulivo", are available for a relaxing and refreshing drink. "La Nassa" (open from June to September) is located at San Domenico a Mare, promises an unforgettable experience, thanks to the skilful hands of the chef Leonardo Di Biase, careful to highlight the recipes of local maritime tradition with special attention to the quality of raw materials. "La Nassa" Restaurant offers also specials oyster and champagne aperitif. Please Note: Only continental breakfast buffet is included in the room rate. English breakfast will be charged à la carte. Tourist tax – the municipality requires the payment of a tourist tax of € 3,00 per person per overnight up to a maximum of 3 consecutive overnights, valid for any stay during May, June, September and October and € 5,00 per person per overnight up to a maximum of 5 consecutive overnights, during July and August. The tax has to be paid on spot. Refined and one of the most spacious Suite of the Masseria. It is located on the first floor and has direct access to the Spa. It has a master bedroom and a separate living room with a charming little balcony with panoramic view. The bathroom is large with tub and shower box and a second toilette. The Talasso Suite overlooks the garden or the olive grove. It is the most exclusive Suite. Ideal also for families or for friend couples and also only for a romantic break. The Suite is decorated with ancient furniture, precious carpets and ceramic by Grottaglie. It offers two double bedrooms, a separate living room featuring a beautiful fireplace and a dining area. Each bedroom has its own bathroom; one with tub and shower with hydro-massage function and the other with shower with hydro-massage function. The San Domenico Suite has a huge terrace of approximately 70 sqm surface, offering a breathtaking view on the pool area and on the sea in the background. 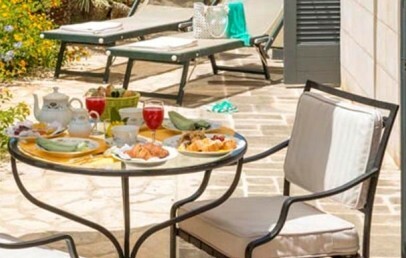 Nice Suite, beautifully furnished recalling the original and typical style of Puglia. They are located on the ground floor and offer a private and equipped garden. The Suites consist of a master bedroom and a living room, that can be used also as a single room. The bathroom has windows, a bathtub and shower. 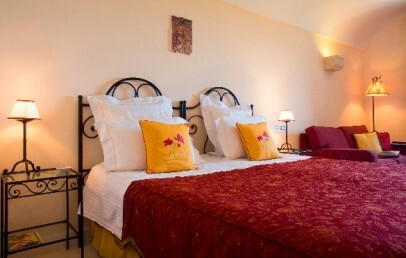 Comfortable double or twin rooms and furnished in a classic and elegant style. They are located on the ground floor or on the upper floor and close to the wellness centre. The bathroom has a tub and hairdryer. Comfortable Suite, elegantly furnished, recalling the original and typical style of Puglia. They are located on the ground floor in the old part of the Masseria. Some have a bedroom and a living area with private bathroom with Jacuzzi tub and separate shower. Other Suites are ideal for 3 people and offer a small patio, a bedroom, a bathroom with window and Jacuzzi shower as well as a second single bedroom with bath. These Suites have been completely renovated in 2014 and are decorated in a classic and modern style. They have a spacious bedroom and a comfortable bathroom with bathtub and separate shower. An inviting private patio, equipped with loungers, chairs and table offers more relax. These Suites are decorated in a classic and modern style and have a bedroom and a comfortable living area. The bathroom is bright and has a bathtub. An inviting small terrace of 15 sqm surface offers more relax. The Suites are located in the ancient part of the Masseria. 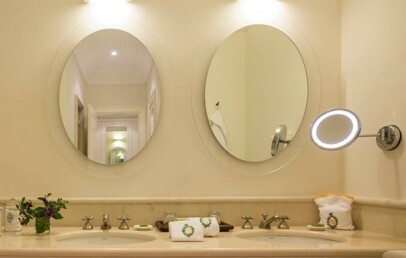 Spacious and comfortable Suites, decorated in a modern style with antique pieces of furniture. The Suites have a bedroom and a separate living room with sofa and table with chairs. They have either one or two bathrooms with bathtub. The Suites are located in the ancient part of the Masseria, either on the ground floor with a patio or on the first floor with a small equipped terrace. Have you ever slept in a Masseria?